I'm super proud of my girl Stephanie Ellen! 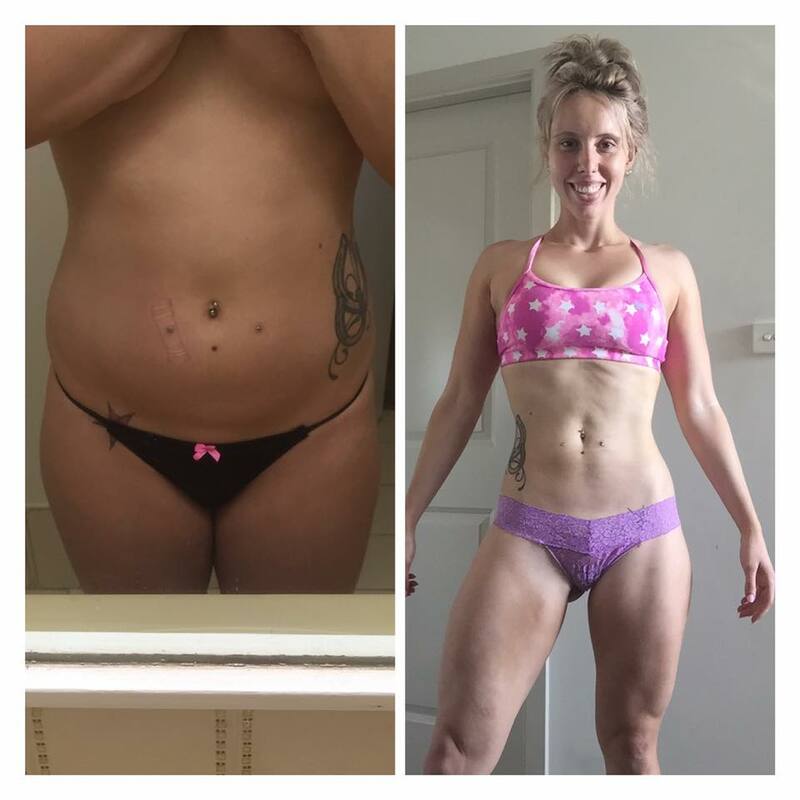 She has transformed her body over the last 12 months by becoming process driven and letting go of a whole heap of head junk around food and training. In fact it's the physiological and emotional change that drives the physical transformation. and she has been kind enough to let me share it with you. "So I've been with SMP for about a year now and I remember being really ambivalent about joining at the start.."
I was doing the typical split sessions plus doing F45 every day and eating next to nothing. I started binging (I'm talking 4000+ cals a day) then would not eat for 3-4 days after and exercise more to 'undo' the damage but it became a cycle and I began to develop signs of an eating disorder." "Anyway I joined SMP, spoke to Nick Bradley-Qalilawa and then Hattie Boydle, where she offered me a new training program and 200 grams of carbs and I laughed thinking 'I'm trying to lose weight and Hattie wants to make me fat!" "So I kept with it and saw some changes at the start which I was super pleased with because I got to eat more and actually lose some weight (and gain muscle)." "In the first 6-9 months my changes fluctuated, I went up and down and thought maybe this was as good as it gets but I kept going because I liked being accountable and tracking my changes even if they were small or non existent. I used to look at photos and think nothing was changing but just kept with it. " "Since around start of September this year, I've started to notice bigger changes. My photos are looking different each week now, aside from what the scales say. Hattie keeps saying 'wow you're looking great' and now I'm starting to see it happen. And it's taken almost three years for my body to be like, hey let's go!" "I've started eating more food than ever now and just keep getting leaner. My lifts have skyrocketed, I've increased my deadlift weight by almost 30kg in the last four weeks, along with all my other lifts. And it's paying off. " "And to top it all off my dexa results today show that things are changing quicker than I can see, a lot of change is happening on the inside so don't be disheartened!" "I guess I wanted to share with everyone, particularly because there have been a lot of new girls join the group recently, that you should NOT GIVE UP it's taken me ages to get to this point and I've still got a long way to go. I didn't understand before but now I do, these things take time. A lot of time. But be patient and trust what Hattie and Nick offer because it really does work, it just takes time and effort. And consistency!! " "My macros are exactly on point pretty much every day and to be honest, I've noticed more changes since that has happened. Since the macros webinar I made the effort to track to the t and I feel that has definitely played a big role. To be fair I try not to eat out often or if I do then I'll have Subway, Nando's, Grill'd, BBQ chicken or something else where nutrition info is available. Sometimes not, but very rarely. So try and hit macros to the 0's as it really does make a difference." I hope you both understand how truly grateful I am for your guidance and support and helping me get to where I right now. Hattie is number one for a reason "
"And also you girls, you are all such empowering, inspiring, beautiful women who provide me with motivation every day and I have been so lucky to develop many friendships since being a part of SMP." "That in itself is invaluable"
"If it was easy to do then everyone would be doing it ️ so keep going!" "Below is my first check in photo with Hattie and my last check in photo from Wednesday. Sorry about the first one, this is when I would take selfies big no no haha!" Email me back with the answers to these three questions. 1: What's your big, secret goal? 2: What has stopped you from getting there so far? 3: Why should I offer you a place in my program? If you're the right fit - I'm going to back you. And, we don't just pick the most polished girls. I really just want to know two things. Can I help you and provide massive value to you? Are you coachable and a pleasant person to work with?